If you have a stray dog please call City Hall at 515-462-1422 between the hours of 8:00 am and 5:00 pm. After 5:00 pm, call the Winterset Police Department at 515-462-1423. We are required to track all dogs to make sure they are properly vaccinated with the Rabies Vaccination. Rabies is a very serious disease. If contracted by an animal or a person, it is 100% fatal, 100% of the time. In order to track this, we issue licenses to all dog owners for a nominal fee of $15 for all dogs that are not spayed or neutered and $10 for all dogs that are spayed or neutered. After you pay, you will then be issued a license certificate and a tag so if you are ever stopped, or if there is a concern about your dog, you can easily prove your dog is licensed, and vaccinated. In order to receive a license, proof of a current Rabies Vaccination is required. If the vaccination expires mid-year, please submit the most recent vaccination record when it is available. You are required to renew your dog’s license each year. There is a $20 late fee for all licenses that are not renewed by January 31st. 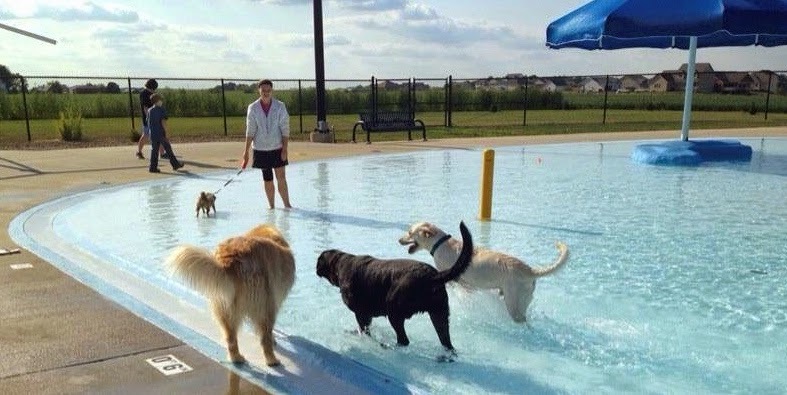 Winterset dogs enjoy the annual “Doggie Dip” event at the Aquatic Center, hosted by the Park & Recreation Department at the end of the summer season.